very comfy. worth the price you pay. Enhance and improve your bedroom decor with the all new Merit Linens double-brushed 3-Piece duvet cover set. Tailored for a perfect fit and made with the finest imported microfiber yarns for ultimate comfort. This luxury duvet cover set is expertly stitched for durability to last a lifetime and raises the bar for coziness and elegance. Includes two matching pillow shams to bring elegance to any bedroom! Dimensions 11.0 In. X 10.0 In. X 4.0 In. I purchased this set in both white and navy. The duvet cover does indeed come with a zipper, at least on both sets I received. I actually like this, as I have a down comforter that sometimes leaks feathers. And the design of the zipping is well done and not easily visible when zipped. However, the pillow shams on the other hand, I don't particularly like for two reasons: 1. They don't fully cover a standard pillow (see picture of the back). Also, the frilly outside border is more prominent than in the item photos in my opinion. However, I still give this item four stars given its price point. 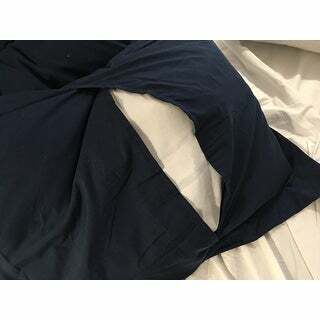 I'm transferring the pillow shams to a guest room and the duvet cover is replacing a $150 high thread count Egyptian cotton set that I have been using for years. It really is more comfortable. I'm glad I gave it a shot. I found a duvet cover on overstock.com that clearly states and their measurements that the king size duvet is 104x90. This is the measurements I need to cover my merit linen seasonal down comforter. Yet I have received this item twice and received the wrong measured size. I have called requesting to receive the size that is listed on their website and yet they still do not send the right one. I specifically asked if they are sure they have the king size measurements in stock, I was told they did so hopefully once I receive my correct item I can put a better review but at this time I am very dissatisfied. I ordered two duvet sets in queen size. One white, which was perfect and lovely, and a purple one that is 9 1/2 inches too wide for the duvet it is supposed to fit. (the pillow shams fit perfectly). I am planning on getting out my sewing machine and stitch it so it fits my duvet. But I am not happy about it. Not the size advertised, not as soft as expected. The sage color is great and just what I wanted but the cover itself is advertised at 90x90 but came in some weird larger size like 92x94. Also it is thoroughly not as soft as I was hoping, still very smooth but far less so than the duvet beneath it, but it DOES come with a zipper (which thankfully has held up and kept me from giving up and returning it). Will likely replace this when I can afford another, but if you're looking for something cheap to hold you over while you shop for something better or got saddled with a duvet that came in an equally odd, unadvertised size, then this will do for the price. These are the softest duvet covers I have ever ordered! I purchased two in the cream color for twin beds in a guest room and boy do they ever change the feel of the bed! I covered two alternative comforters and these make the bed feel so luxurious! Easy to cover and has button closure. My only slight concern is that the "cream" is the darkest cream I have ever seen and really is a warm mushroom or dark tan color. It still works with my other colors so I am keeping, though I had hoped for a lighter color. The cream is definitely not an ecru or beige. Bought this set for our son’s room. The zipper enclosure is a nice detail to help keep his down comforter in place. The shams included fit standard sized tempurpedic pillows perfectly. The whole set is super soft, breathable, and washes well. I ordered this duvet in a KING/CAL KING size, its generously made, there is no peek-through in color from my comforter, and washes great. Just wish I would've ordered another one! Very happy with the duvet cover. Has ties in all corners and a zipper to close. Size was perfect for a queen comforter insert. I ordered this in Burgundy. The color was not as deep burgundy as I was looking for but was close enough to work. I purchased it to use in my travel trailer on my king sized bed. I was able to fit my king sized down comforter inside with plenty of room to spare. It looks great and is very soft and comfortable to sleep under. I would recommend this product. I love my new duvet cover. I got it in the navy blue color and it was exactly what I thought it would be. It fit perfectly around the duvet insert that I already had. The zipper is a nice touch, because buttons are hard to work with. I thought my pillows were going to be too big to fit inside because they’re super fluffy, but the fit perfectly. I gave it a good wash before putting it on my bed and it looks great. I ordered the Aqua color. It's bright and pretty. Very soft and lightweight. I really like it. I really like this duvet cover. It is very soft, and the zipper makes it so much simpler to close it up instead of buttons. So far it has stood up to our dogs, and is worth the price. Bought a few for my rental apts. always good quality,washes well. Bought for my son. He said it looks and feels very nice. Super soft Duvet cover. have washed it 100 times and still keeps the color and softness. Very soft cotton. Great buy. My sister loves this duvet set. She says how can something that is used to protect something be so soft and beautiful and comfortable. plus easy to care for, she is impressed. 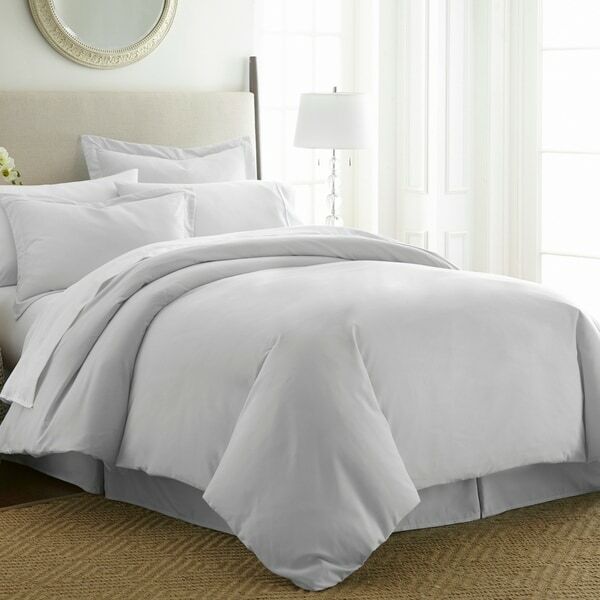 Really like the softness of the duvet fabric and pillow shams. Quality is good too. Color I chose goes great in the bedroom. Recommend this product! Great duvet cover, gave a 4 because I was disappointed in the color-not what I was expecting. More like a sky blue I thought. "Is the sage actually more blue-green or a yellow-green? Thanks for any feedback." I would say that sage is more of a yellow-green. It's named for the plant, so it's a very natural-looking color that goes great with many decors. "Does the king size have a button enclosure and ties in the corner to secure the duvet?" "Does this duvet cover have ties in the corners to keep the conforter in place?" "Does this have a zipper closure or a button closure ? The product info states that it has both which is misleading and confusing. Other people have noted a button whiles others have noted a zipper. I am asking about the queen size duvet set in Navy specifically." This would have a zipper enclosure, you should be all set. "Please clarify, does this duvet have a zipper? And does it have corner ties? I see conflicting answers (buttons and no ties). It's important to know for sure. Thank you." The duvet cover has buttons and corner ties. Yes it does. Beautiful and soft. Fits very well. Washes great! "The above review states that the duvet comes with ties, however there is a below question asking if it does and the answer was no. Please advise." "Does it have anchor points to hold the comforts in place?" No I don't believe it does I ended up safety pinning the bottom corners.